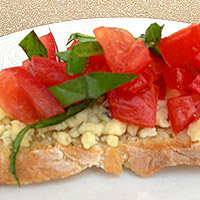 I love Bruschetta in the summer when the tomatoes are vine ripe, but I came up with this fancier version for a dinner party the other day. It takes the original and gives it a French twist. I used Ashley’s French bread recipe for the base, which you can find under breads, but any artisan bread from the grocery store will also work. Slice one red onion into thin strips and sauté in olive oil on med low until tender. This process takes about ten minutes, and a hot pan will frizzle the onions and ruin them. Once they are tender, sprinkle red wine vinegar over the onions and turn the heat down to low. Continue to cook for 2 -3 more minutes. The onions will turn deep purple and become caramelized. Roll basil leaves like a cigar and slice with a sharp knife to produce ribbons. Mix tomatoes and basil and add some salt and pepper. Let mixture sit for 15 minutes or more to marinate. Turn broiler on low. Slice French bread thinly and brush with olive oil. Layer onions and blue cheese, and put under the broiler until bread is toasted and cheese is slightly browned. Add tomato topping and serve immediately.